This tutorial explains the basics of Excel structured references and shares some tricks on using them in real-life formulas. One of the most useful features of Excel tables are structured references. When you have just stumbled upon a special syntax for referencing tables, it may look boring and confusing, but after experimenting a bit you will surely see how useful and cool this feature is. What are structured references in Excel? A structured reference, or table reference, is special way for referencing tables and their parts that uses a combination of table and column names instead of cell addresses. This special syntax is required because Excel tables (vs. ranges) are very powerful and resilient, and normal cell references cannot adjust dynamically as data is added or removed from a table. Compared to standard cell references, table references have a number of advanced features. To add structured references to your formula, you simply select the table cells you want to refer to. The knowledge of a special syntax is not required. When you rename a column, references are automatically updated with the new name, and a formula does not break. Moreover, as you add new rows to the table, they are immediately included in the existing references, and the formulas calculate the full set of data. So, whatever manipulations you do with your Excel tables, you don't have to worry about updating the structured references. 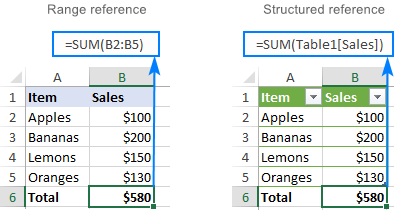 Structured references can be used in formulas both inside and outside an Excel table, which makes locating tables in large workbooks easier. To perform the same calculation in each table row, it is enough to enter a formula in just one cell. All other cells in that column are filled automatically. Making a structured reference in Excel is very easy and intuitive. If you are working with a range, convert it to an Excel table first. For this, select all the data and press Ctrl + T. For more information, please see How to create a table in Excel. Start typing a formula as usual, beginning with the equality sign (=). When it comes to the first reference, select the corresponding cell or range of cells in your table. Excel will pick up the column name(s) and create an appropriate structured reference for you automatically. Type the closing parenthesis and press Enter. 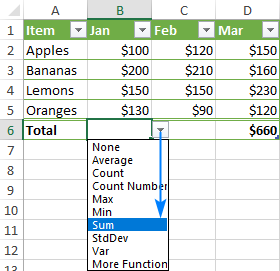 If the formula is created inside the table, Excel automatically fills the entire column with the same formula. Though the formula is the same, the data is calculated in each row individually. To understand the inner mechanics, please take a look at the table reference syntax. After the opening parenthesis, start typing the table name. As you type the first letter, Excel will show all matching names. If necessary, type a couple more letters to narrow down the list. Use the arrow keys to select the table name in the list. Double-click the selected name or press the Tab key to add it to your formula. Type the closing parenthesis and press Enter. 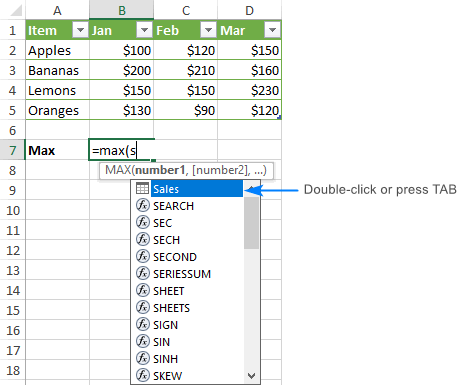 For example, to find the largest number in our sample table, we start typing the MAX formula, after the opening parenthesis type "s", select the Sales table in the list, and press Tab or double-click the name. As already mentioned, you do not need to know the syntax of structured references to include them in your formulas, however it will help you understand what each formula is actually doing. Usually, a structured reference is represented by a string that begins with a table name and ends with a column specifier. The table name references only the table data, without header row or total rows. It can be a default table name like Table1 or a custom name like Regions. To give a custom name to your table, carry out these steps. If your formula is located within the table it refers to, the table name is usually omitted because it is implied. Column specifier references the data in the corresponding column, without the header row and total row. A column specifier is represented by the column name enclosed in brackets, e.g. [South]. To refer to more than one contiguous columns, use the range operator like [[South]:[East]]. To refer to specific parts of a table, you can use any of the following specifiers. [#All] The entire table, including table data, column headers and total row. [#Headers] The header row (column headers). [#Totals] The total row. If there's no total row, it returns null. [@Column_Name] The current row, i.e. the same row as the formula. Please notice that the pound sign (#) is used with all the item specifiers, except the current row. To refer to the cells in the same row where you enter the formula, Excel uses the @ character followed by the column name. The following operators allow you to combine different specifiers and add even more flexibility to your structured references. As with normal range references, you use a colon (:) to refer to two or more adjacent columns in a table. For example, the below formula adds up the numbers in all the columns between South and East. To refer to non-adjacent columns, separate the column specifiers with commas. For instance, here's how you can sum the data rows in the South and West columns. It is used to refer to a cell at the intersection of a specific row and column. Please notice that the [#All] specifier is required in this case because the column specifier does not include the total row. Without it, the formula would return #NULL!. All column and special item specifiers must be enclosed in [square brackets]. A specifier that contains other specifiers should be wrapped in outer brackets. For example, Regions[[South]:[East]]. If a specifier contains two or more inner specifiers, those inner specifiers need to be separated with commas. In table references, column headers don't require quotes whether they are text, numbers or dates. In structured references, some characters such as left and right brackets, pound sign (#) and single quotation mark (') have special meaning. If any of the above characters is included in a column header, a single quotation mark needs to be used before that character in a column specifier. For example, for the column header "Item #", the specifier is [Item '#]. To gain more understanding about structured references in Excel, let's go over a few more formula examples. We'll try to keep them simple, meaningful and useful. When counting something in a specific column, be sure to output the result outside the table, otherwise you might end up with circular references and wrong results. The fastest way to add up numbers in an Excel table is to enable the Total Row option. 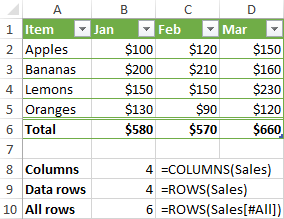 To do this, right click any cell within the table, point to Table, and click Totals Row. The total row will appear at the end of your table straight away. Please note that unlike SUBTOTAL, the SUM function adds up values in all the rows, visible and hidden. Multiple column references are absolute and do not change when formulas are copied. Single column references are relative and change when dragged across columns. When copied/pasted via a corresponding command or shortcuts (Ctrl+C and Ctrl+V), they do not change. In situations when you need a combination of relative and absolute table references, there is no way to copy the formula and keep table references correct. Dragging the formula will change the references to single columns, and copy/pasting shortcuts will make all the references static. But there are a couple of simple tricks to get around! To make a single column reference absolute, repeat the column name to formally turn it into a range reference. To see how relative and absolute table references work in practice, please consider the following example. In Excel tables, structured references to several columns are absolute by their nature and remain unchanged when copied to other cells. To me, this behavior is very reasonable. But if you need to make a structured range reference relative, prefix each column specifier with the table name and remove the outer square brackets as shown below. For example, the below formula with an absolute structured reference adds up the numbers in the current row of the Jan and Feb columns. 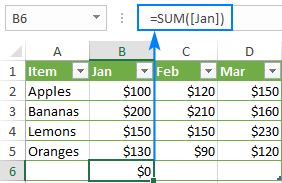 When copied to another column, it will still sum Jan and Feb.
That's how you make table references in Excel. To have a closer look at the examples discussed in this tutorial, feel free to download our sample workbook to Excel Structured Reference. I thank you for reading and hope to see you on our blog next week. 4 Responses to "Structured reference in Excel tables"
I've discovered structured references and want to do more with them. Seems like they only work as intended (auto filling columns) on the same worksheet with the table / query. Is there a trick to doing this from a different worksheet? Structured references can also be used from a different worksheet. When making a formula, you just need to select cells in the original table using the mouse. In this tutorial, you can find some examples of formula with structured references outside a table. I see your examples on structured references in columns. How can I use this in rows? 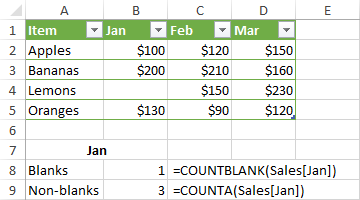 I want a cumulative total column next to a column of values. I can do this with =SUM($B$3:B6) in column C but can I do this with structured references? My table has a column called DESCRIPTION and one called AMOUNT. I would like a cumulative column with a running total.